So your venue's booked, catering on its way. Now it's time to really ensure your event is one to remember. You want your guests to be raving about your wedding for weeks to come, so let’s help you create the ultimate musical experience for you and your guests! From the ceremony through to the final notes of evening entertainment, we can provide small elements of music or the full soundtrack to your day. We can learn songs for you, advise you of the best song choices, oh, and we can perform a wide range of genres to ensure all your friends and family feel the vibe! Simply choose below from our four comprehensive packages and get in touch. We'll work it all out for you! “After hours of standing around drinking followed by hours of sitting down eating, the last thing you necessarily feel like doing is hitting the dance floor, that's why a good band is key to getting everyone up and keeping the party going." All our packages are based around a vocalist, keyboardist, drummer, guitarist and bass guitarist. Each booking also includes a personal discussion about genres and styles of music that you would like the band to perform for your event. 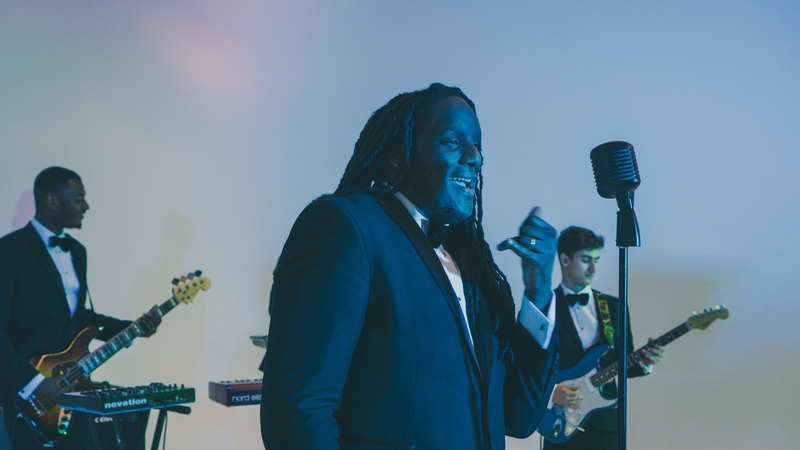 Need some live music to bring the vibe to your wedding? Then choose our simple Silver Package, providing you with live, upbeat music during the party section of your wedding reception. Really wanna let your hair down and dance the night away to some of your favourite hits? Why not step it up a notch, with our Gold Package - giving you more time to party along to live music, with live performances of special request songs of your choice. Like what you see in our promo videos? This is the package to help you create just that. Our Platinum Package adds a cool saxophonist giving you a fun, extra element. We turn things up a notch or two to give you a truly unforgettable party experience, alongside a DJ to keep your guests partying through the night. Looking for something to really make a statement? Then let us help you create the party experience you could only dream of with our Big Band options. These premium packages take your musical senses on a spectacular ride, with your favourite party-hard tunes performed by a range of bold instruments, including a fabulous brass section, percussion and digital synths. This service is perfect for large weddings, parties and corporate events. Looking for something to really make a statement? Then let us help you create the party experience you could only dream of. This premium package gives you your very own personal event consultant, who to ensure every musical and logistical detail is handled. Leave your guests with dropped jaws and have people amazed after having had The Velvet Experience! Fancy a musical touch to other parts of your day as well? Let us help you create the perfect vibe for you and your guests. Our Ceremony, Lounge or Jazz packages are available to add on to any of our evening party band or Big Band packages for a reduced cost of £1,800. Any of the above packages can be booked as stand alone packages for £2,495 each. Chat to a member of our bookings team to see how we can add some musical flair to your wedding day! * Lounge to be a 4 piece or so when booked as an add on.